Modernity has had so many meanings and combines so many contradictory sets of attitudes and values that it has become impossible to use it to define the future. It crashes like an overloaded computer. Hence the idea is that modernity might need a sort of reset. Not a clean break, not a “tabula rasa,” not another iconoclastic gesture, but rather a restart of the complicated programs that have accumulated in what is often called the “modernist project.” This reset has become all the more urgent now that the ecological mutation is forcing us to reorient ourselves toward an experience of the material world for which we don’t seem to have good recording devices. This book is first organized around six procedures that might induce readers to reset some of those instruments. Then, once this reset has been completed, readers might be better prepared for a series of new encounters with other cultures. After having been thrown into the modernist maelstrom, those cultures have difficulties as grave as ours in situating themselves within the notion of modernity. It is not impossible that the course of these encounters might be altered after modernizers have reset their own way of recording their experience of the world. At the intersection of art, philosophy, and anthropology, Reset Modernity! has assembled approximately sixty authors, most of whom have participated in the Inquiry into Modes of Existence initiated by Bruno Latour. 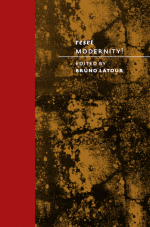 Much like the earlier books Iconoclash and Making Things Public, this volume documents and completes what could be called a “thought exhibition”: Reset Modernity! held at ZKM | Center for Art and Media Karlsruhe from April to August 2016. The book, generously illustrated, includes contributions, excerpts, and works from many authors and artists.